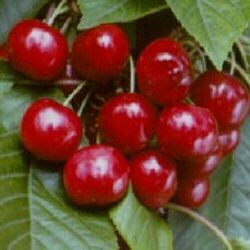 Buy cherry tree Prunus Avium Morello for sale online from UK specialist suppliers of garden fruit trees. Morello Cherry (Prunus Avium Morello) is a large, dark red cherry of excellent cooking quality. Suitable for those areas of the UK where you could not mistake it for being somewhere in the South of France i.e. not so much sun. Morello Cherry is not the sort of tree that you could just point in the direction of your garden and it will go and plant itself but it is reasonably trouble free in that you could put it in a less than full sun position and it will be ok. If you are looking to lead a complete or partial "Good Life" by cooking or brewing your own then Morello Cherry trees are the perfect UK choice. You will know when the cherries are ripe when they are dark red or when your gardening savvy neighbour is dressed in a black Ninja suit and carrying a blacked out fruit holding device whilst scaling your fence at one hour past bed time 'o' clock to steal them. Leaving them on the tree for longer until they are closer to black makes them a little more palatable if you want to try eating them straight off the tree. Self-Fertile/Not Self-Fertile: This cherry is self fertile and will produce Morello cherries without the need of another Cherry tree nearby however as with most other self fertile Cherry trees, yield should be increased if another Morello Cherry tree is planted within 50m. Morello can be used to pollinate other sweet cherries however the opposite is not true. Answer: Planting another Morello tree close by will help. Although the Morello is technically self-fertile, having more Cherry pollen around in the garden will help.